I usually have some amazing story to go along with why I decided to make these delicious recipes that I found; unfortunately my story this time is because it looked so good. I am just obsessed with finding healthy desserts because I love to eat them, but hate the guilt that follows….anyone with me? This I simply wanted to share because the holidays are coming up sooner then we think and I thought this would be appropriate to add to any dessert menu. Enjoy!! (The filling can be made a day or two ahead of time if desired. Or, if you’d prefer quicker a baked apples recipe, feel free to use canned or jarred apple pie filling instead of my homemade filling.) For the filling: Place 1 cup of the chopped apples in a small pot with the water. Bring to a boil, then cook on low for 7 minutes. 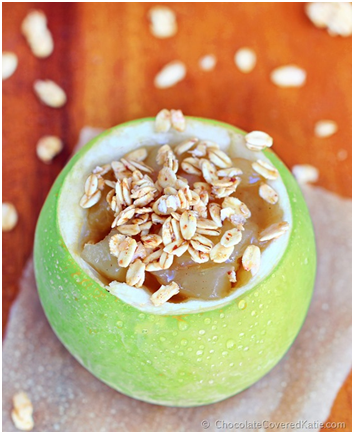 Meanwhile, blend all other ingredients except the whole apples in a blender until smooth. Add the blended mixture to the saucepan and bring back to a boil. Immediately turn to low heat and cook 30 minutes, stirring very occasionally. Let cool, then refrigerate uncovered or loosely covered. Wait at least 4 hours before proceeding with the recipe, as this filling thickens in the fridge. Preheat oven to 350 F, and grease a baking pan or line with parchment paper. Slice the tops off each whole apple, and scoop out the center by cutting around the core with a knife and then scooping out the core and a bit of the flesh with a spoon. (Eat the scooped out flesh, or save for a different recipe.) Place in the pan and bake 22 minutes, then remove from the oven and scoop about 3 tbsp (or as much as you can fit) filling into each baked apple. Return to the oven and bake another 14 minutes. Finally, broil 2-3 additional minutes.